EPM Support from Green Mountain Nutritional Services Inc. was designed to complement the treatment that your veterinarian will provide. 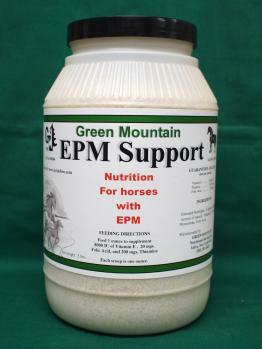 EPM Support is a nutritional supplement formulated with natural vitamin E, thiamine and folic acid. These vitamins support the horse by reducing some of the neurological signs and preventing deficiencies that may be caused by the medications that your veterinarian will prescribe. EPM Support should be fed continuously once a diagnosis is confirmed. In addition to EPM Support you may also want to feed our Body Conditioner to help increase energy and support the immune system. A recurrence can happen after treatment but you can reduce the chances and severity with EPM Support. Equine Protozoal Myeloencephalitis (EPM) is a disorder of the central nervous system primarily caused by parasites found in possum, skunk and/or feral cat feces. Some symptoms of EPM are head tilting, difficulty swallowing, weakness and/or a sore back. There are other symptoms and if EPM is suspected your veterinarian should be consulted for diagnosis and treatment. How Can EPM Support Help My Hose With EPM? One ounce of EPM Support supplies 8,000 IU of natural Vitamin E, 200 milligrams of Thiamine, and 20 milligrams of Folic Acid. Natural Vitamin E is 36% more available than synthetic Vitamin E.
How Do I Feed EPM Support? Feeding Directions: 1 ounce per horse per day. EPM Support should be fed continuously once a diagnosis is confirmed. In addition to EPM Support you may also want to feed our Body Conditioner to help increase energy and support the immune system. A recurrence can happen after treatment but you can reduce the chances and severity with EPM Support. Our 5 pound container is an 80 day supply.